You’ve heard quite a lot about the site of l’Esquerda here by now, and more if you braved the numbers at the Kalamazoo paper indeed. I haven’t finished, however, as I was there a couple of months back as part of this trip whose telling I am still unwinding, and firstly it is one of the best-displayed archæological sites I’ve ever seen, secondly it is highly photogenic and thirdly and most importantly it has given me a heartening story, which I will now share. But first! The obligatory scenery photo! I won’t try and explain once more why this place is important, I’ve done it before.1 So, just the travelogue here. The first thing is to explain that I hadn’t even planned to go to Roda de Ter, where it is, next. I had been meaning to go to Sant Pere de Casserres, but couldn’t face planning it at the end of the previous day’s labours and so woke up next day to find, on inspection, that there was no public transport there at all. I could have got halfway out on the bus back to Folgueroles from market, but it wasn’t market day in Vic and even had it been I’d still have had to walk the rest and would have arrived late and then had to walk all the way back too. Really, the only way out was a hiking route, which despite the previous day’s experience I would have been prepared to chance if I’d had time to do it; but by the time I’d made sure of this, I would have arrived just as the museum shut and had to come back in the dark. No. So instead I took the next day’s plan instead, which was to Roda de Ter and l’Esquerda, and because Roda is quite big and new-industrial, I could just hop on a bus to it and be there and back in half a day. So I did. The kind lift back from Vallfogona recounted in the previous one of these posts put me in the town of Ripoll, with the option either of running for a train right away, or waiting an hour and looking around. Even in the failing light, the latter seemed the wise option because last time I was here, I had to miss it out and I didn’t want to do so twice. Besides, Ripoll grew somewhat during industrialisation and its medieval heritage is now constrained to a fairly small area, which is easy to look around if, as I had, you arrive too late to get inside the monastery. If you are a medievalist, however, you’re here for the monastery of Santa Maria, which I have often mentioned here before but for which I now have my own pictures. Even this is more nineteenth-century history than you might expect, though, because as has also been mentioned here this place was burnt down in 1835, with the loss of its entire archive. What you see here is a careful and painstaking 1880s reconstruction. It’s a tremendous job, but there is therefore a reason why it appears so well-preserved. Santa Maria is now very much embedded in the town, but it probably always was since the actual parish church, Sant Pere de Ripoll, which like Santa Maria and Sant Joan have been here a long time in some form or other, is hardly any distance away at all, and as early as we can tell this sort of thing about it (908, to the best of my knowledge) it was being staffed by the monks.3 So Benedictine though it might have been, this monastery was in direct contact with the people it ruled. That impossibility of putting the place to work for me is one of the reasons why I’ve never made the effort to get here for the place itself; instead I have tended to be here because it’s the railhead for exploration of the Ripollès more widely. Nonetheless, it is very much worth seeing: as a learned correspondent said of it in an exchange at the time, “comme c’est beau!”. The western portal at Santa Maria de Ripoll, from Wikimedia Commons, whose photographer had better light than did I; this is your actual authentic Romanesque. 1. And, obviously, at all points in between; it’s just that it’s substantially the eleventh and twentieth centuries they’ve chosen to memorialise in the parts of the town where I went. 2. There’s a number of dedicated studies of Santa Maria, largely from an architectural point of view, but I’m here working off Antoni Pladevall i Font, Joan-Albert Adell i Gisbert and Xavier Barral i Altet, “Santa Maria de Ripoll” in Pladevall (ed. ), Catalunya Romànica X: el Ripollès, ed. Jordi Vigué (Barcelona 1987), pp. 206-334. On the metal bishop geezer, see n. 5 below. 3. Sant Pere turns up in a donation of that year from the lost Ripoll archive that we have in regestum, a donation made by one Francolino, who was the person who by failing to provide proof that backed up their claim lost Guimarà and Bonita their case against Abbess Emma in 918 that I mentioned in the Vallfogona post, in fact; this was a small world. The document is printed in Ramon Ordeig i Mata (ed. ), Catalunya Carolíngia IV: els comtats d’Osona i de Manresa, Memòries de la Secció històrico-arqueològica LIII (Barcelona 1999), doc. no. 156, which explains: “Abbates enim et Monachi servientes domum S. Petri presentes et futuri ita obtineant sicut ceteris alodibus S. Petro pertinentibus”, ‘for the abbots and monks, present and future, serving the house of Saint Peter may obtain it just like the other alods belonging to Sant Pere’. Sant Pere doesn’t have an abbot or monks of its own, so they must be coming from the monastery next door. For more on Francolino, see n. 8 below; for more on Sant Pere, see Antoni Pladevall i Font, Joan-Albert Adell i Gisbert, R, Bastardes i Parera and J. Bracons i Clapés, “Sant Pere de Ripoll” in Pladevall, Catalunya Romànica X, pp. 335-343. 4. The old archive is discussed pithily by Ordeig, Catalunya Carolíngia IV, I pp. 36-39. 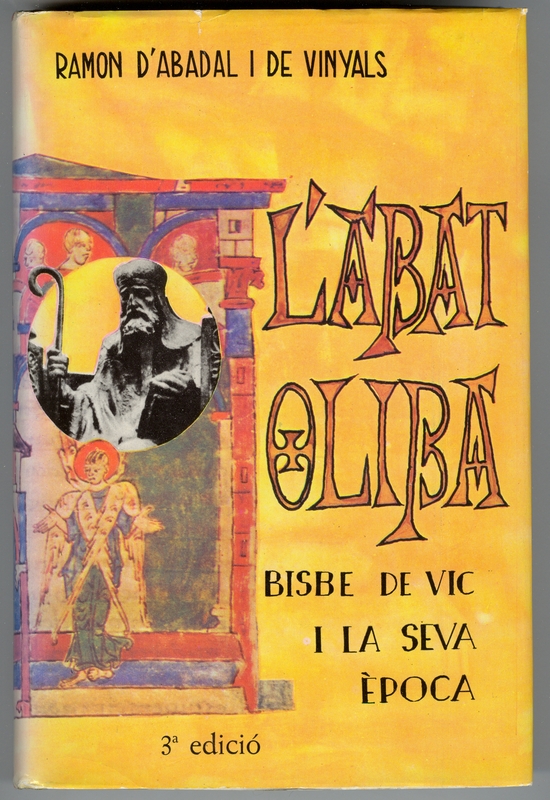 Cover of Ramon d'Abadal i de Vinyals's L'Abat Oliba, Bisbe de Vic, i la seva època, 3rd edn. 6. Roc d’Olzinelles, “Índex de les donacions de comtes i reis i de les butlles pontifícies existents a l’arxiu de Ripoll”, Biblioteca de Catalunya, MS 430. Not on loan when I wrote this, you’ll be glad to know! 7. Quite a lot of this material is in Ordeig, Catalunya Carolíngia IV, and presumably lots more is in other volumes of the Catalunya Carolíngia, but it’s still quite hard to know how much we do have that was copied by various people for various purposes and is now scattered from Madrid to Paris. A reasonable dissertation project for someone close to the area might be to try and assemble a kind of Diplomatari de Ripoll and see if we can work out what survives, how much there might originally have been and what areas we’ve obviously not got. I did inquire about getting a grant to do this from the Generalitat at one point but it never got further than informal enquiries because those never got answered. Oh well. 8. One instance being Francolino, seen in n. 3 above, who had land in many places around Sant Joan apparently but whom we only see give to Sant Pere de Ripoll, and another being a chap called Anno, who at one point is working as saio, a kind of Visigothic constable, in Vallfogona, but is seen before that representing the Abbot of Santa Maria in court. On these guys see Jarrett, Rulers and Ruled, pp. 62-64 & 42-43 respectively. For the phase before Abbess Emma’s majority when Santa Maria’s abbot, Dagui, ran Sant Joan, see R. d’Abadal i de Vinyals, “La fundació del Monestir de Ripoll” in Miscel·lània Anselm M. Albareda Vol. I, Analecta Montserratensia Vol. 9 (Montserrat 1962), pp. 187-197, repr. in idem, Dels Visigots als Catalans Vol. I, pp. 485-494, though be aware that this is one of many cases where they fitted the reprint into its swollen double volume by leaving out the useful documentary appendix. If there are any of my students reading, could you look away for a moment? Thankyou. You see I have to confess something: teaching the range I was teaching last term involved prescribing more than a little reading that I myself had actually never read. There’s just never been time to cover everything that might be useful on these subjects I don’t primarily work on.1 I started making this time, however, and I’m making inroads on my overloaded to-read shelves, much of which I got hold of specifically to use in teaching in fact. Every one of these that can go onto the office shelves with me secure I have some idea what’s in it, I feel a bit less of a fraud, though there’s a long way to go on that front. Okay: students, you can look again now. Have you ever read Richard Hodges‘s and David Whitehouse‘s Mohammed, Charlemagne and the Origins of Europe? You absolutely should, it’s only short, it has the classic early Hodges flavour of attack where everyone else is wrong and we will all be led to the truth by the shining golden light of ARCHAEOLOGY, where Hodges was its prophet,2 but it also has a startlingly broad focus endowed it by the fact that Whitehouse had dug not just in Italy (where in the seventies they seem to have more or less turned Archeologia Medievale into a news-sheet for Brits to tell the Italians what bit of the local past they’d put spades into now), but also in more farflung locales like Africa and, most unusually, Iran before the fall of the Shah, after which, as we have remarked here before, it has been a little difficult to do much digging that doesn’t come up landmines.3 This means that the book is almost bound to tell even the most learned Westerner something they didn’t know about points east—it mentions Kilwa, for example, although in the period they are concerned with the big entrepôt on the East African coast actually was in Kenya, at Manda—and for me it was about Samarra. The works of al-Mansur at Baghdad were dwarfed by those of al-Mutasim and his successors at Samarra for in forty-six years they created a city which sprawled along the Tigris for 35 kilometres: from Woolwich, as it were, to Kew…. Al-Mutasim built a palace larger than Versailles in 836-42; al-Mutawakkil replaced it with another, almost as large, in about 849-59; al-Mutamid built a third in 878-82. Ozymandias just ain’t in it. 1. It’s astonishing how much patching of this you can get away with simply by going to seminars where the relevant people tell you what’s in their work instead, of course. This is the big secret reason for my high level of conference attendance. 2. If you haven’t met this strain of his work, you will find it writ large in R. Hodges, The Anglo-Saxon Achievement: archaeology and the beginnings of English society (London 1989). These days he is a bit less combative, though of course who knows what his Dark Age Economics: a new audit (London forthcoming) will be like. If, like me, you are waiting for that with bated breath (though once I own it, who knows when I’ll actually read it…) you may be excited to know that there is an article-length summary entitled “Dark Age Economics revisited” in a volume of his papers I only lately found out about, Goodbye to the Vikings: (London 2009), pp. 63-71, and that volume must join his Towns and Trade in the Age of Charlemagne (London 2000) on my to-read list. You see, this list never actually gets shorter, it just feels more up-to-date. 3. The part of the book I’m writing from here is R. Hodges, D. Whitehouse, Mohammed: Charlemagne & The Origins of Europe: archaeology and the Pirenne thesis (London 1983), pp. 123-157. 4. Ibid., pp. 151 & 157. 5. Ibid., p. 151 n. 29, citing Ernst Herzfeld, Ausgrabungen von Samarra VI: Geschichte der Stadt Samarra (Berlin 1948). I’m sorry to disappoint Gesta, but I don’t think I can make the extra composition time it would take to do all my Catalonia posts in Bonzo Dog Doo Dah Band filk. It seems to me that if I were to do it for this one the song to use would probably be `Ali Baba’s Camel‘, since the placename in question is syllabically almost as long as that title and the references to running miles and miles could probably be left in, and if anyone wants to have a go, I would love to see it. But actually I am just going to show you pictures of a place called Vallfogona, and talk about visiting it. Will you permit me one another post dancing round the supposed feudal transformation? You will? So kind, I’ll try and make it interesting by including, as well as the duelling historians, good old Unifred Amat, the much-beloved castellan of previous posts, as well as the inevitable Count-Marquis Borrell II of Barcelona. Let’s first set up some background. As Chris Wickham teaches us, there are several ways one can read the word `feudal’ when you’re actually doing scholarship on this period: there’s the grand-scale Marc Bloch whole-society sense, in which feudalism is the defining ethic that pervades social conduct and organisation, as espoused these days by Poly and Bournazel; there’s the Marxist sense, in which it is an economic organisation in which production is controlled by the producers but a ruling class extracts surplus from the producing class in order to maintain their social and economic dominance, as opposed to various other forms I won’t discuss here, as espoused, well, mainly by Chris really; and there is a more restricted sense about the organisation of power, in which the resources for military power are farmed out to lesser lords by greater ones in exchange for the lesser lords doing various services to the greater. This can also be called `feudo-vassalitic’, which is a horrible word but avoids confusion with the other two senses, something that has otherwise happened a great deal leading for several scholars to argue for an end to the use of the term `feudal’ at all, since what happens is that people use evidence for one sense about another and so on and so on.1 (Like matriliny and matriarchy.) So here I am talking solely about the third, feudo-vassalitic, sense. Obviously there is some cross-over: a society where power is organised solely via military bonds of service is probably not going to have a capitalist economic set-up, because that would allow other means of power organisation to operate and would make a paid army far more effective and less dangerous to those in power. (There are probably exceptions, but stay with me.) Likewise such a society is likely to preach ethics of loyal service and heroism that get into the literature and help pass those ethics out more generally, and so on. This is kind of the Bloch argument by the back door, however, and I don’t want to go there with this post (not least because it took him a two-volume book). I just want to talk about organising military service in frontier Catalonia. I freely admit that I give that in full solely because I need it for the Feudal Transformation course next year, but you get the idea. The bits I’ve thrown into bold were in the vernacular in the original, these documents containing the earliest written Catalan there is.3 So okay, there’s that. Now there’s an argument against the whole idea that Western European society goes through terrible spasms around the year 1000 (or, ya know, whenever) that runs that instead the documentary record does so, and starts recording things that have been going on for a long time already that we previously didn’t see because the documents were formulaic, and recorded Roman-derived ideals not actual practice.4 Leaving aside the obvious issue that if the documents are changing the demand for them must also be changing, implying changes in the constitution of society that are probably quite substantial, it is also possible to attack this idea in more direct ways by proving that the documents do respond to change.5 And then it’s possible just to haul up counter-examples where what seem to be contemporary details over the organisation of power are thrashed out in a completely different way, and that’s where I’m going here. So, Unifred Amat, right? Guifré is a frontier settler, wanting a new project, and Unifred is his local lord; Unifred doesn’t have spare land so gets some from the count. Problem: why does Unifred do this? Guifré must be subject to him in some way that is not stated for this to work. the classic feudal answer: Unifred wishes to repay Guifré for various services or to enrol him for future ones (effectively enfeoffing him with land) and thus prevails upon his own lord to grant the land and then sells it. Guifré gets the land under terms of service that we don’t have, possibly entirely oral given the vernacular’s use in such oaths later, Unifred thus gets a client and the money, Borrell gets, well, nothing. Obvious problems: Borrell gets nothing while Unifred becomes more important, and then there is the money: Guifré pays through the nose for this land, can he really also be a feudal dependant? With that kind of spare money, why be dependent at all, or at least, why not get better terms than that? even more complex: Guifré is Unifred’s follower in some way or other and they wish, or Unifred wishes, to arrange a relationship of subjection for land in a quasi-feudo-vassalitic style for which as yet the documents do not exist; Unifred gets the land from Borrell and gives the money to Guifré so that Guifré has a counter-gift to make which expresses his obligation in some way; that is, the money is a token for the service that Unifred was really receiving. Advantage: pacifies Barthélemy. Problems: involves assuming that almost all the documents are misrepresenting things and that we know better. In particular, why use a sale formula that explicitly says that Guifré has paid all his dues for the land (“nichil de isto precio ad me comparatore remansit et est manifestum“)? A donation formula would have been more suitable; there are plenty of documents out there that do contain donations with conditions, using phrases like “in tale racione videlicet ut…” and then setting a rent or whatever.10 So the documents could have done this better, if this is what’s going on, and the money is still very hard to explain. At the end of this, I at least am clear in my mind that this is not a feudal agreement. A fifth way of reading it is that a client of Borrell’s is here being set up with a local lord, or that Borrell is increasing his trusted castellan’s personal army to help him hold the frontier zone down; Borrell was keen on ensuring that sort of thing, ideally without paying for it himself.11 In that case, the initiative might have been the count’s, which would have its echoes in genuinely feudo-vassalitic documents but which is not here being arranged feudally. If the initiative was Guifré’s, however, then his terms were presumably advantageous to him; he wanted the land and was willing to pay. Why he approached Unifred is harder to say, but Unifred’s family was certainly important. If the initiative was Unifred’s, it makes slightly more sense, but one would expect the terms of subjection to be more explicit. It must be said that Borrell often did this, selling land to his men for large sums, but they were usually holding from him on other terms elsewhere beforehand.12 Maybe that’s the case here too and Unifred had already set up Guifré in this area and now wanted to let him do more; it’s odd that we don’t have the document but arguments from silence never hold much water round here. But it’s the money, the money that messes up any simple feudal equivalence here; Guifré obviously had means, he could have just bought land from someone else. On the other hand, it’s the gift from Borrell that messes up a simple sale hypothesis. Unifred was demonstrating a connection to the count here, and that implies patronage. But if it was straight feudalism, he’d have no need to do that; the need to demonstrate patronage implies competition with other possible patrons. And that gives agency to Guifré; presumably, he could choose from whom to get his land. (I mean, presumably he could have approached the count himself!) So in fine, I think what we have here is Borrell choosing to reinforce Unifred’s status as local domnus (not that that term is used), which might also explain the solemn curse and so on, and Unifred apparently needing comital help to hold on to that status when a wealthy local chooses to test this. I don’t see anything here to indicate that that local need have wound up as Unifred’s vassal, or that Unifred wound up with anything more than 200 solidi. If that was the aim of the game, this was a very strange way to organise it and, although much better ones would be available later, rather better ones were also available now. Because of the implied competition for clients, however, it seems more likely to me that the local climate of lordship itself was not fully formed here, rather than that the means of record for it hadn’t yet been invented. I see here Carolingian, Matthew-Innes-style patronage, where the centre chooses to endorse one of a number of possible local interests who need that endorsement to achieve local dominance.13 We seem to be a long way here from the world of the convenientiae, and that’s in political as well as documentary terms. So there is still, for me, a transformation to explain here, and probably will be for a while. 1. It’s probably as well to give these references again I suppose: Chris sets out the three ideal types in “Le forme del feudalesimo” in Il Feudalesimo nell’Alto Medioevo (8-12 aprile 1999), Settimane di Studio del Centro Italiano di Studi sull’Alto Medioevo Vol. 47 (Spoleto 2000), pp. 15-46 with discussion pp. 47-51; opposition to the whole idea mounted classically by Elizabeth A. R. Brown, “The Tyranny of a Construct: Feudalism and Historians of Medieval Europe” in American Historical Review Vol. 79 (Washington DC 1974), pp. 1063-1088, repr. in Lester K. Little & Barbara H. Rosenwein (eds), Debating the Middle Ages: issues and readings (Oxford 1998), pp. 148-169, and more thoroughly and crossly by Susan Reynolds, Fiefs and Vassals: the medieval evidence reinterpreted (Oxford 1994). Bloch: M. Bloch, La société féodale (Paris 1949), transl. L. A. Manyon as Feudal Society (New York City 1961); Poly & Bournazel, Jean-Pierre Poly & Eric Bournazel, La mutation féodale, Xe-XIIe siècles (Paris 1981), transl. Caroline Higgit as The Feudal Transformation, 900-1200 (New York City 1983), 2nd edn. in French 1991. 2. Here I’ve used F. Miquel Rosell (ed. ), Liber feudorum maior: cartulario real que se conserva en la Archivo de la Corona de Aragón (Madrid 1945), 2 vols, I. doc. no. 418 of between 1039 and 1049; this must be reprinted in Gaspar Feliu & Josep María Salrach (eds), Els Pergamins de l’Arxiu Comtal de Barcelona de Ramon Borrell a Ramon Berenguer I, Diplomataris 19-21 (Barcelona 1998), but I didn’t have time to order that up as well. If you want the Latin/Catalan, I can provide. For more on this kind of document you can see the very excellent Adam J. Kosto, Making Agreements in Medieval Catalonia: power, order, and the written word, 1000-1200 (Cambridge 2001), though it doesn’t entirely supplant Michel Zimmermann, “Aux origines de Catalogne féodale : les serments non datés du règne de Ramon Berenguer Ier” in J. Portella i Comas (ed. ), La Formació i expansió del feudalisme català: actes del col·loqui organitzat pel Col·legi Universitari de Girona (8-11 de gener de 1985). Homenatge a Santiago Sobrequés i Vidal, Estudi General: revista del Col·legi Universitari de Girona, Universitat Autonòma de Barcelona Nos. 5-6 (Girona 1986), pp. 109-151, with English summary p. 557. 3. J. Bastardas, “El català vers l’any 1000” in Immaculada Ollich i Castanyer (ed. ), Actes del Congrés Internacional Gerbert d’Orlhac i el seu Temps: Catalunya i Europa a la fi del 1r mil·lenni, Vic-Ripoll, 10-13 de novembre de 1999 (Vic 1999), pp. 495-513 with French & Provencal résumés & English abstract p. 514. 4. This argument is of course forever associated with the name Dominique Barthélemy, who propounded it in “La mutation féodale a-t-elle eu lieu? (Note critique)” in Annales : Économies, sociétés, civilisations Vol. 47 (Paris 1992), pp. 767-777, later expanded into La mutation féodale a-t-elle eu lieu? (Paris 1997) with the addition of other reprinted articles, the whole question reprised again in his L’An mil et la Paix de Dieu : la France chrétienne et féodale, 980-1060 (Paris 1999); in English, his thinking can be accessed in idem “Debate: the feudal revolution. I”, transl. J. Birrell in Past and Present no. 152 (1996), pp. 196-205; Barthélemy, “The Year 1000 Without Abrupt or Radical Transformation”, eds & transl. Lester K. Little & Barbara H. Rosenwein & rev. Barthélemy, in Little & Rosenwein, Debating the Middle Ages, pp. 134-147 and now Barthélemy, The Serf, the Knight and the Historian, transl. Graham Robert Edwards (Ithaca 2009). 5. The best counter-attacks so far mounted (of course) by Pierre Bonnassie, firstly in “Sur la genèse de la féodalité catalane : nouvelles approches” in Feudalesimo nell’alto medioevo, pp. 569-606, and idem, “Nouveautés linguistiques et mutations économico-sociales dans la Catalogne des IXe-XIe siècles” in Michel Banniard (ed. ), Langages et Peuples d’Europe : cristallisation des identités romanes et germanique. Colloque International organisé par le Centre d’Art et Civilisation Médiévale de Conques et l’Université de Toulouse-le-Mirail (Toulouse-Conques, juillet 1997), Méridiennes 5 (Toulouse 2002), pp. 47-66. 6. J. Jarrett, Rulers and Ruled in Frontier Catalonia, 880-1010: pathways of power (London 2010), pp. 144-151. 7. Ramon Ordeig i Mata (ed. ), Catalunya Carolíngia IV: els comtats d’Osona i de Manresa, Memòries de la Secció històrico-arqueològica LIII (Barcelona 1999), doc. no. 678. Like most of the documents relating to Sal·la and sons, this one only survives as a typescript copy of an original that someone took away for `safe-keeping’ during the Spanish Civil War. I live in hope that this cache will some day turn up. There is also ibid. no. 679, which does survive in the original and appears to be a variant copy of 678 by a different scribe allotting slightly different terms to the grant. I can't work out any way to make this part of solving the puzzle I deal with here, rather than just another complication, so I leave it aside in the argument. 8. Ibid., doc. no. 680. 9. Michel Zimmermann would have us believe that Borrell and his father were extremely short of money, which is why they kept selling castles (“La rôle de la frontière dans la formation de Catalogne (IX-XIIème siècle)” in Las Sociedades de Frontera en la España Medieval. Aragón en la Edad Media: sesiones de trabajo, II seminario de historia medieval (Zaragoza 1993), pp. 7-29 at pp.17-18), but for me at least the way that Borrell managed his resources doesn’t fit thus; he frequently gave stuff away, as here, which you might think he could have demanded payment for, and it’s not clear to me why his expenses should have been much higher than his forebears, who certainly went to war more often than he did. I don’t mean to say he didn’t want to keep those expenses down (see n. 11 below!) but that isn’t the same thing, necessarily. 11. So, witness Cebrià Baraut (ed. ), “Diplomatari del monestir de Tavèrnoles (segles IX-XIII)” in Urgellia: anuari d’estudis històrics dels antics comtats de Cerdanya, Urgell i Pallars, d’Andorra i la Vall d’Aran Vol. 12 (Montserrat 1995), pp. 7-414, doc. no. 23 where Borrell gladly passes on to the eponymous monastery a frontier civitas and fortress that he has apparently been garrisoning with standing troops at his own expense, turning it into into a monastic development zone. This is, I think, the only clue we have that he did this and it also contains a fabulous lengthy description of what he expects that development to look like, so it’s well worth a look. In fact I should make it into a ‘From the Sources’ post. 12. The most obvious example is the family of the previous post, the castellans of Gurb, where Ansulf was Vicar of Sant Llorenç already when Borrell gave him a whack of land in Gurb but who then bought a church nearby from the count for a swingeing amount of gold (discussion and references Jarrett, Rulers and Ruled, pp. 116-117) but he is far from the only example (more and general discussion ibid. pp. 151-154). 13. Matthew Innes, State and Society in the Early Middle Ages: the middle Rhine valley 400-1000, Cambridge Studies in Medieval Life and Thought 4th Series 47 (Cambridge 2000), more or less passim really.